The 2018/19 VMSL Premier Division season is going down to the wire, with three teams still very much in the mix to lift the title as we head into the final week of the league season. Only one point separates leaders Croatia SC and second placed Rino’s Tigers and CCB LFC United as the three sides get set to play their final league matches this week. Making things even tastier is the fact that Croatia and Rino’s meet in their final match of the season at Point Grey on Saturday afternoon (kick off 4pm) in the knowledge that the championship dream is over for the loser, while the winner has to then hope that CCB slip up in one of their final two matches to be played in Surrey next week. It’s going to be a fantastic end to what has been one of the most competitive VMSL seasons for many years, with the snow and fixture backlog actually helping in setting up this dramatic conclusion. 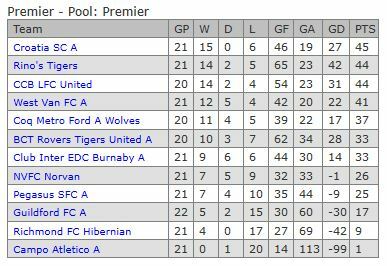 Rino’s kept their title hopes alive with a 1-0 win over West Van FC at Ambleside on Wednesday night. Both teams headed into this one with their title aspirations still in tact but a loss would spell the end for either side, while a draw would probably end it for both of them. Rino’s dominated the match, and were deserved winners in the end, but the first half ebbed and flowed and it was West Van who had the best early chance when Keith Jackson raced in on goal but shot wide. That miss was to prove costly as Rino’s turned up the heat in the second half, launching wave after wave of attacks on the home goal. But they were up against the best defence in the division, and they were holding firm. 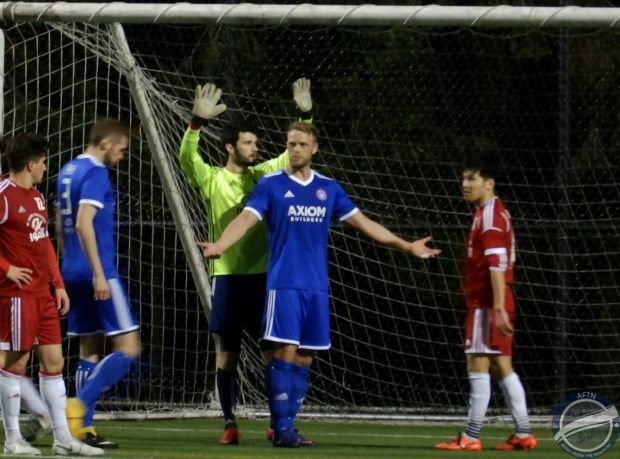 The Tigers’ breakthrough finally came in the 60th minute when former TSS Rovers defender Danylo Smychenko’s curling shot was parried by the West Van keeper straight into the path of Kristian Yli-Hietanen and the UBC striker made no mistake from six yards out to fire Rino’s into a lead that they weren’t to give up. Things got a bit chippy and lippy towards the end, but Rino’s held on for the crucial victory, ending West Van’s title hopes but keeping their own firmly alive. Rino’s win now sets up a cracker of a match on Saturday as they take on Croatia SC in both teams’ final match of the campaign and with one point separating the sides. Watching on from the sidelines hoping for a draw will be CCB LFC United. 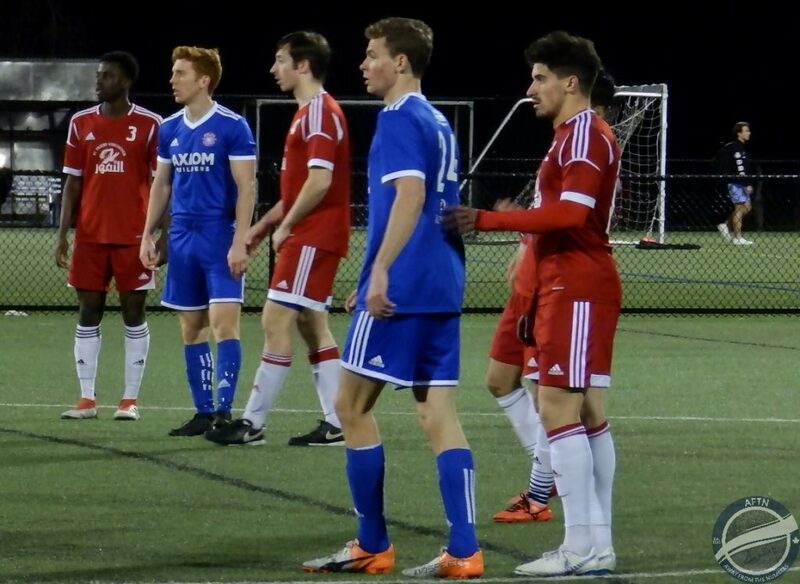 The Surrey side still have two games of their season remaining taking on local rivals Pegasus SFC on Tuesday at Newton and then facing another team in which there is no love lost between them, Club Inter EDC Burnaby, on Friday night at the same venue. If Rino’s and Croatia draw on Saturday, CCB will win the title with a victory in either of their final two matches, but a win for either team will force CCB to win both of their remaining games to win the championship. Here’s how the table is currently looking. It’s going to be a cracking end to the season, so get out and take in some of the action if you can.